Sorbet, sherbet... what's the difference? 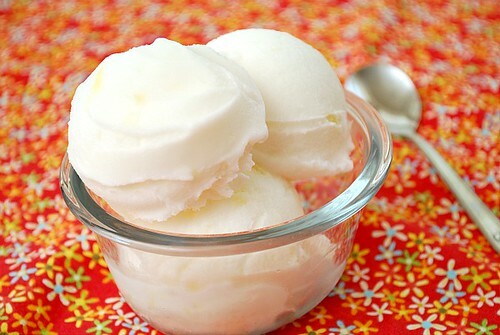 For starters, sorbet uses water and sherbet uses milk as the main liquid to bring everything together. For this recipe, I used fresh, ripe pineapples. You can probably find a good deal on them in the summer and I find they have a brighter, more truer flavor than using canned pineapples. You'll want to cut up fresh pineapple and freeze them before using. This helps speed up the freezing process when the mixture of pineapple, sugar, extract and milk are churned in the ice cream maker. Feel free to play with this a bit with other fruits, making sure the fruit totals to no more than 2 cups frozen. Combine pineapple, sugar, lemon extract and milk in a blender; puree until smooth. Chill the mixture for at least 2 hours. Place mixture to the bowl of an ice cream maker and freeze according to the manufacturer’s instructions. Transfer mixture to freezer-safe container and freeze for at least 2-3 hours for flavors to meld. 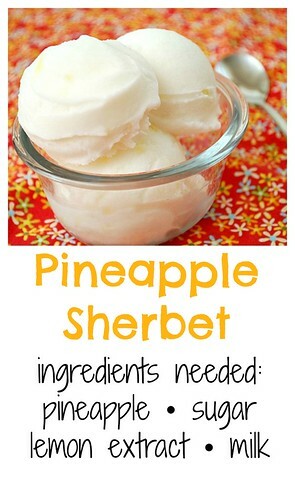 To serve, leave sherbet out on counter for a few minutes to soften for easy scooping.